In addition to borrowing heavily, the US collects over 28% of the nation's GDP to support various government expenditures. As the government spending continues to grow to stimulate demand, the US national debt is ballooning, forcing Uncle Sam to pursue offshore tax cheats. Thursday is the deadline for Americans to come clean about the money they have hidden offshore, in places like Swiss bank accounts. No one can say with certainty how much money is out there — the accounts are secret — but the hoard may be tens of billions of dollars, The New York Times’s Lynnley Browning reports. Several thousand wealthy Americans have come forward, hoping to avoid large fines or possibly even prison. But many others are still weighing their options. The choice is clear: They can confess and pay the penalties, or gamble that they will not get caught. With the deadline only days away, tax lawyers say they are being inundated by anxious clients, according to the New York Times. In contrast to the US, Pakistan collects only about 11% of the country's GDP in tax revenue. Farm income, mostly earned by the nation's feudal ruling elite, accounting for about 20% of the GDP is entirely exempt from any income tax under the law. Only 2.5 million of 172 million Pakistanis pay income tax. Of them, 1.8 million are salaried and paid Rs.27.37 billion in taxes during ended fiscal 2008-09, according to a report to the Senate by Minister of State for Finance and Economic Affairs Hina Rabbani Khar. The government runs large current account deficits, forcing it to beg and borrow to meet the budget needs. The budget deficit for 2008-09 was 4.3% of GDP and it is likely to grow with lower revenue amidst slowing economy in 2009-10. The tax evasion in Pakistan is estimated at Rs500 – 600 billion a year, almost half of the total tax collection of about Rs1200 billion during 2008-08. The untapped amount is almost equivalent to the country’s annual budget deficit. In a country where majority of the transactions, including purchase of big ticket items, occur in cash, there is widespread tax evasion and a sizable informal economy. The estimates for Pakistan's underground economy vary from 25% to 50% of the formal economy. A recent World Bank (WB) report concluded that every Pakistani citizen evaded tax amounting to Rs 4800 in the year 2007-08, while the total tax evaded in the period stood at Rs 796 billion. During the height of corruption under Bhutto-Zardari-Sharif governments in the 1990s, the size of the underground economy rose to almost 55% in 1999, by one estimate. As the military regime of President Musharraf cracked down on tax cheats, the nation's revenue collection doubled from Rs. 500 million in 2000 to to Rs. 1.04 trillion in 2007-08. For example, Benazir Bhutto, Asif Zardari and Nusrat Bhutto declared assets totaling $1.2 million in 1996 and never told Pakistani authorities of any foreign bank accounts or properties, as required by law in Pakistan. Zardari declared no net assets at all in 1990, the year Bhutto's first term ended, and only $402,000 in 1996, according to a report in the New York Times. There have been widespread complaints in Islamabad, including by Finance Minister Shaukat Tarin, that the government had solutions to improve the power output but was refusing to implement them in order to benefit a handful of power plant operators, such as those supplying rental power at exorbitant rates, while the IPPs are not being paid for supplying power from currently underutilized installed capacity. Requests for information by Transparency International Pakistan regarding rental power contracts have been ignored by the Ministry of Water and Power. There are widespread corruption allegations against Mr. Zardari personally who has influenced the award of the 783 MW rental power contracts to a former governor of Oklahoma and his Pakistani partner. There are reports that Mr. Zardari is continuing to extort businesses to enrich himself and his cronies. As Tariq Ali put it in a recent article for Counterpunch, "Zardari has carried on from where he left off as minister of investment in his late wife’s second government. Within weeks of occupying President’s House, his minions were ringing the country’s top businessmen, demanding a share of their profits." Ali continues, "Take the case of Mr X, who owns one of the country’s largest banks. He got a call. Apparently the president wanted to know why his bank had sacked a PPP member soon after Benazir Bhutto’s fall in the late 1990s. X said he would find out and let them know. It emerged that the sacked clerk had been caught with his fingers literally in the till. President’s House was informed. The explanation was rejected. The banker was told that the clerk had been victimized for political reasons. The man had to be reinstated and his salary over the last 18 years paid in full together with the interest due. The PPP had also to be compensated and would expect a cheque (the sum was specified) soon. Where the president leads, his retainers follow. Many members of the cabinet and their progeny are busy milking businessmen and foreign companies." As Pakistan faces a severe economic crisis and the current leaders appear ready to mortgage the nation's future, the chances of the ruling elite setting a good example by paying their taxes in full appear rather remote. In fact, the feudal politicians are fighting the current IMF condition for even a modest tax on farm income. The only hope for a fairer tax system and improved collection from the rich and powerful to fund education and health care lies in serious and sustained pressure on Pakistan's ruling elite from the donors and lenders, backed by the United States. This is really fascinating, thanks. I've long wondered about the Pakistani tag regime, and I am disgusted to think that the highest officials are so corrupt. How can they call on Pakistani citizens for anything when they themselves can't fulfill even the basest of national duties like pay their taxes? All politicians are corrupt. Power corrupts and absolute power corrupts absolutely. did not usa tell the whole world that iraq has WMD and waged the war and where is the WMD ? 1- The tax payer is a very small segment of the population, limited to industry and service sectors. These sectors are highly taxed to the extent of their becoming uncompetitive both from the points of exports and import substitution. The way taxes are recovered is by upfront deduction in the form of with holding (or advance) income tax on the revenues earned, generally much more than what is finally due after tax computations, so tax evasion is very limited and not a major issue. During Musharraf's tenure, these sectors became pretty well documented so by and large are part of the formal economy. However, to increase revenues, the government taxes these sectors more, thereby actually reducing tax revenues as businesses keep becoming uncompetitive and closing down fast. Enterpreneurs switch to trading which is by and large in the informal sector, thus spiralling a downward trend in revenue collection increasing dependence on aid and overdrafts. 2- An expansion of tax net to agricultural sector is a logical step and should be implemented too to discipline the politicians as you've said. However, this will not result in much increase in tax revenues as agricultural sector is very inefficient has low productivity. Production is not increasing as much as the costs thereby rendering agriculturists cash strapped. If proper accounting is imposed, they'll come up with little taxable earnings. The affluence you see with Pakistani rural elite is because they extract a lot from government funds when they're in power. And the rich families always remain in power because of multiple and shifting alliances. So while I agree that rural income should be taxed, it is to bring sanity into the political system by disciplining the politicians; it will not increase tax revenues substantially. 3- The only way tax revenues can be increased is by a) increasing industry and service sector outputs by adopting investment friendly policies, including lowering of taxes, and b) increasing agricultural productivity by changing its complexion to an indudtry like venture thereby bringing in investments to increase farm productivity. Tax on agriculture will then become a significant source of revenue. I agree with your conclusion about US forcing Pakistani political elite to pay taxes as the only seemingly possible way forward, but then this becomes part of "micromanagement" that is fast becoming an issue in Pakistani media, political circles and civil society. The urban middle classes appear well set to becoming the harbinger of the campaign against US micromanagement in Pakistan, thereby once again damaging themselves as well as the country's future. It was widely reported over a year ago that the corruption case was closed and $60 million handed back to Asif Zardari after the Pakistani Government withdrew its requests for judicial assistance from Switzerland and said it had no claim on his assets. After an agreement in February this year by the Swiss banking giant UBS to pay $780 million and admit to criminal wrongdoing in selling offshore banking services that had enabled tax evasion, 14,700 Americans with foreign bank accounts have now come forward and admitted wrongdoing and agreed to pay taxes. See the contrast? While US aided and abetted Zardari's corruption and tax evasion by sponsoring amnesty of Zardari by Musharraf, American attitude is very different when it comes to enforcing the law in US. KARACHI: The Overseas Chamber of Commerce and Industry (OICCI) has launched Investment Survey Report (ISR) 2009 according to which the business margins have come under pressure, leading to declining profitability and hence declining investments in Pakistan. The results of the OICCI ISR show a limited increase in FDI by 0.97 percent, Rs 148 billion in FY08 as compared to Rs 146 billion in FY07. Behind this nominal increase law and order, power deficit and implementation of policy remain significant concerns impacting both new FDI and re-investment by existing companies. However, this cautious but continued increase in investments comes as a positive surprise, forecasts for the following year i.e. FY09 indicate that members plan to withhold investments by approximately Rs 55 billion – a substantial decline of approximately 37 percent. It is worth mentioning that despite declining profitability, tax paid to the government has increased by 8.41 percent. Basically, the ISR 2009 report is based on the responses of 124 member companies (71 percent of OICCI members) and gives a snapshot of foreign investors and companies present in Pakistan. Farrukh H. Khan, President, OICCI, while launching of ISR 2009 said that the key conclusions to be drawn from the Survey are that although OICCI member companies have continued to grow in terms of revenue, margins have come under pressure, leading to declining profitability and hence declining investments in Pakistan. Pointing out the main issues he said that important issue impacting profitability, highlighted by OICCI members repeatedly, is the high incidence of direct and indirect taxes in Pakistan – which remains the highest in the region. He further added that as important stakeholders and partners in Pakistan’s progress, OICCI would urge the government to implement its recommendations and continue to include OICCI in policy-making forums. However, “most of the OICCI budget proposals were also neglected in the previous budget,” he claimed. The ISR 2009 highlights that new and concrete measures are needed to enhance tax revenue by expanding the tax base rather than imposing further taxes on existing taxpayers, which has started to yield negative results. Despite the challenging global climate, exports from OICCI member companies increased by 33 percent to RS 34.8 billion during FY07 and FY08. While recorded figures in Corporate Social Expenditure indicate a decline, it must be noted that these are not completely reflective of the full degree of contributions. Whether it is contribution towards national tragedies like that of the recent Internally Displaced Persons (IDPs) in the aftermath of the military operations in the North or investing in society for overall development, member companies continue to make generous contributions in cash and kind as well as in the form of sharing of skilled personnel. It should be noted that the 124 members (survey respondents) of OICCI have invested paid-up capital worth $9.6 billion in Pakistan with the majority of investment in sectors such as Financial Services (27 percent), Oil/Gas & Energy (21 percent) and Food & Consumer Products (18 percent). The total equity (capital plus reserves) would be significantly higher. While Pakistan’s intrinsic comparative advantages have succeeded in attracting significant amounts of foreign investment into the country, it is important to realize that unless the potential for development and growth is carefully utilized in the near term, OICCI members or other potential investors may reconsider their priorities with regards to existing and planned investments in Pakistan. ISLAMABAD – The assets declared by the members of the Parliament (MPs) to Election Commission of Pakistan (ECP) were challenged in the Supreme Court here on Friday. The petitioner, Advocate Sikandar Hayat Khan, argued that the assets declared by the MPs were not correct. The application was filed under Article 184/3 of the Constitution. The applicant pleaded that accurate estimation of their assets should be undertaken while an inquiry should be conducted regarding others assets named after their (MPs) families, praying that appropriate direction may be issued to the Chairman FBR to protect national kitty. “Through print and electronic media, an impression has been created that certain politicians, their wives and dependent children have amassed huge assets which require due scrutiny by tax authorities, who alone have the expertise to clarify the impression in the public interest,” petition stated. From such newspaper reports including electronic media broadcasts, it seems that assets amassed by politicians, their wives and dependent children were either not subjected to scrutiny by various tax jurisdictions or are highly understated, it added. “I am a taxpayer along with others in Pakistan and it is in public interest that a scrutiny be carried out by various tax jurisdictions of Pakistan regarding the amassing of assets by politicians, their wives and dependent children in the interest of justice. That is also desirable to have a correct valuation of the amassed assets of the politicians, their wives and dependent children, as in its absence, the burden of existing tax payers is increased because they are subjected to higher rates of taxation with a view to filling the gap between what they pay and what they ought to be paying. It is relevant to mention here that the applicant is also a former senior most officer of the Income Tax Group on National basis. Here's a report from The News about Pakistan's growing debt. KARACHI: Pakistan’s debt sustainability indicators deteriorated in July-Dec 2009 as external debt and liabilities were up, while foreign exchange earnings remained stagnant and the economy slowed down, the SBP said in its report. The total external debt as percentage of GDP as well as debt servicing to export earnings ratio worsened during the period under review, the bank said. The stock of external debt and liabilities increased by $4.7 billion to reach $55.8 billion in the first half of the current fiscal year, it said. External debt servicing was $2.648 billion by end of Dec 2009, up 9.7 per cent from the same period of the previous year, as the country repaid bilateral creditors, multilateral donors and private non-guaranteed debt. Yet, almost 25 per cent the increase in external debt and liabilities was due to depreciation of the US dollar against major currencies, the SBP in its report said. With $180 billion GDP, Pakistan's debt to gdp ratio is about about 30%. While I agree that it can become a serious problem if not properly tackled, I also think it can be managed if the economy starts to grow again soon. That's the real challenge for Pakistan right now. Chairman Federal Board of Revenue (FBR), Sohail Ahmed has said that FBR has found, with the help of Nadra database, that 300,000 to 500,000 people are earning more than tax exempted limit, but are not paying taxes. Speaking at a dinner meeting of Korangi Association of Trade and Industry (KATI) on Saturday, he said that FBR had advised and persuaded all the newly discovered tax evaders to start paying taxes and sending the SMS on the advice of the Finance Minister, Shaukat Tarin. Referring to General Sales Tax scheme (GST), he said that GST scheme would be converted into Value Added Tax (VAT) mode gradually. Due to exemptions, concessions and frequent changes in GST scheme it was decided either to clean it or substitute it with the VAT mode, he added. However, he added that VAT would only be implemented after the approval of the parliament but it is more likely that there would be two rates of VAT. He assured the business community that FBR would consult the stakeholders and take them into confidence before finalising the VAT system. He added that the FBR officials would soon start visiting chambers and trade bodies to discuss and get feedback in this regard. Sohail said that VAT scheme is prevalent in 150 countries out of which few had withdrawn it, but three of them again adopted VAT mode regime. He opined VAT mode has a potential to generate Rs600 billion as it would be levied both on goods and services, which would be collected by the single agency FBR, provincial assistance and co-operation after getting consensus from all the four provinces during NFC Award meeting. Regarding Self-Assessment Scheme (SAS), the Chairman said that the scheme would continue as it has yielded good results. He agreed that revenue targets for the current fiscal are not modest but also not unachievable either. Regarding bowing down to IMF he said that he feels ashamed sometimes when he faces the IMF officials. He agreed with the KATI Patron In-Chief that if, as a result of the incentives given to the expatriates, the remittances double, then the country would not need to beg from IMF. S M Muneer stressed the need to provide level playing field to the trade and industry in order to compete in the region. He said that Pakistani manufacturers are fully capable of competing or able to perform better than China, India and other competitors if the ever-increasing tariffs of gas and power would be brought at par with the competitors. He reiterated his claim that if the overseas Pakistanis are given only one percent incentive the remittances would be 16 billion dollars by the next year and there would be no need to beg from the exploiters such as IMF and World Bank. He said that IMF is all-out to destroy Pakistan's economy and the government must come out of its shackles. The Chairman, KATI, Razzak Hashim Paracha said in his welcome address that VAT should not be replaced with GST without consultations with the business community otherwise its implementation may not prove successful. He said that VAT mode scheme would be a totally new experiment for our country. It would again take a long time for taxpayers to get accustomed by it. He said that the industry, especially the export sector, should be provided level playing field as soaring utilities prices are causing massive shut down of industrial sector. The Chairman, KATI's Standing Committee on FBR and Taxation, Mian Zahid Husain advised the government to support legal economy against parallel economy if it wants VAT system to be successful. He said that tax collectors should collect taxes softly and there should be no harassment otherwise they would not be able to get even the revenue they are getting right now. KARACHI: The foreign loans obtained by the government reached 55 percent of the gross domestic product (GDP) and any new loan will put Pakistan on the list of mortgage states. Public Accounts Committee (PAC) Special Committee on Budget Analysis Chairman Chaudhry Nisar Ali Khan, who is also head of PAC, expressed concerns over the grave situation Tuesday. The PAC of the National Assembly will take serious views of the budget 2010-11 and foreign loans position today (Wednesday). According to the government’s GDP rules and regulations, the government cannot surpass GDP’s 60 percent limit of taking foreign loans, as the present situation is already alarming. Around 70 percent of the annual budget is being spent on defence, (Rs 675 billion) and Rs 683 billion on retiring foreign loans and interest, he added. The federal government under National Finance Commission Award has to give 55 percent to 57 percent of the Rs 1 trillion towards the provinces’ share. Punjab will get 47 percent share, Sindh partaking stands at 45 percent, Balochistan at 139 percent and Khyber Pakhtunkhwa 88 percent. The PAC committee members including PPP MNA Raheela Qaimkhani, PML-Q MNA Waqas Akram, PML-N MNA Ramzan Masila, Jamat-e-Islami Senator Fareed Piracha and MQM Senator Dr Abdul Haq will discuss in length the budget 2010-11 allocations on major heads, implications of new taxation on the direction of International Monetary Fund (IMF) and World Bank and share of major sector in GDP. The PAC members special committee on budget analysis will also deliver their expert opinions and suggestions to the government to save the country from plunging into the list of mortgage states. It is a matter of concern that the budget deficit 2010-11 is Rs 680 billion and the government has already planned to levy tax on public utilities, which are already running on the higher side. The government will fetch over Rs 46 billion from sales tax, billions of rupees from withholding tax, billions from surcharge on cigarette and curtailing 30 percent budget allocated for public welfare development projects in the country. The government was unable to meet the condition of restricting the gap between its income and expenditure to under Rs 769 billion or 5.1 percent of the GDP. Pakistan has ended up with a budget deficit of 6.2 percent. Commenting on the situation, Sindh Agriculture Forum senior member Shakeel Ahmad said the country’s foreign debt stood at Rs 3,000 billion and in only two years 2008-09 alone, it swelled to Rs 9,400 billion. He said country’s export target is $20 billion while imports will stand $32 billion with a gap of $12 billion. Under such industrial and commercial activities, the country will not reach the export target, he added. The IMF wanted Pakistan to raise tax revenue from the present 10 percent of GDP to 15 percent by 2013, which is peril for our economy, Ahmad maintained. The IMF has already indicated that the conditions for release of the last tranche of $1.85 billion bailout package for Pakistan will be tougher. The IMF would ask Pakistan to meet its conditions for levying tax on the agriculture sector, enhance energy price and ensure implementation of value-added tax (VAT) (new form of general sales tax) by October 2010. He demanded of the President Asif Ali Zardari and PAC to inform the nation about the fact-findings, as the nation has great concern about the fate of the country. Finance Minister Abdul Hafeez Shaikh and State Bank of Pakistan Acting Governor Yaseen Anwar along with a team are holding a meeting with the IMF officials in Washington on August 5 to pave way for the release of over $1.8 billion, the second last tranche of the $11.4 billion bailout package. Of mounting concern to the Obama administration is the potential for serious unrest if the economy unspools further: inflation by some predictions will reach 25 percent in the coming period. The price of sugar has tripled, and the cost of flour has doubled since the government came to power nearly three years ago. In particular, Washington wants the government to raise taxes on the wealthy landed and commercial class, a shortcoming that has become especially galling as Pakistan’s dependence on foreign donors rises. Pakistan’s revenues from taxes are among the lowest in the world: only 2 million Pakistanis of a population of 170 million pay income tax, according to estimates by the United States. A report in a leading newspaper, The News, said Monday that Mr. Gilani and 25 of his ministers, including the finance minister, Hafiz Shaikh, did not pay income taxes at all, according to sworn affidavits by the ministers to the Election Commission of Pakistan. The alarm about the economy was first sounded by Mr. Shaikh, a former officer of the World Bank, who told a government meeting last month that the government had only enough money to pay two months’ salaries. The economy was “teetering on the brink” before the floods but was now heading for the “abyss,” Mr. Shaikh was quoted as saying. Mrs Clinton said: "It's absolutely unacceptable for those with means in Pakistan not to be doing their fair share to help their own people while taxpayers in Europe, the United States and other contributing countries are all chipping in." The EU and US have contributed some $450m (£280m) each to the Pakistan flood aid effort and the EU has also offered a trade deal to lift certain duties. Mrs Clinton went on: "The most important step Pakistan can take is to pass meaningful reforms to expand its tax base. "The government must require that the economically affluent and elite support the government and people of Pakistan." The BBC's Syed Shoaib Hasan in Islamabad says Pakistan's tax system has come in for a great deal of criticism in recent years. Tax collection remains abysmal, he says, and Pakistan's elite routinely evade taxation by using political influence. The worst offenders include landlords and industrialists, some of whom are part of the current government, our correspondent says. Following the floods, hospitals, schools, bridges and thousands of kilometres of roads need to be rebuilt with a total reconstruction bill that could stretch into tens of billions of dollars. The floods, caused by heavier than usual monsoon rains in July, inundated a fifth of the country, destroying or damaging almost two million homes. ADB's recent report on Pakistan's economy released before recent floods says tax-to-gdp ratio in FY 2009 under PPP govt dropped to ten year low of only 8.8%. And this has been happening in Pakistan as well, ever since the Swiss Parliament’s historic move to pass the Return of Illicit Assets Act (RIAA). There, too, the tax evaders have started transferring billions of dollars from their Swiss bank accounts to secret destinations in Europe and Asia. According to recent estimates, roughly $200 billion — four times the external debt of Pakistan — is stashed away in Swiss banks and is now being withdrawn. Top sources in Lahore say they have evidence that Pakistanis are moving their black money to two destinations — London and Islamabad — via PN, and opening sub-accounts with FIIs. “Our problems are similar. They are making everything above board, everything official,” said Ali Mohammed, a broker at the Karachi Stock Exchange. Earlier this month, Christa Markwalder, president, Foreign Affairs Committee (Presidentin Aussenpolitische Kommission des National Rats) of the Swiss Parliament told Tarun Vijay, MP and national spokesperson of the Bharatiya Janata Party, that she had recently explained to Finance Minister Pranab Mukherjee about how the matter could be resolved to India's satisfaction. Incidentally, Vijay was the first to directly contact the Swiss government in this regard. But Jethmalani feels India is not pressing the Swiss hard enough. “Soon, there will be a crash of an unusual nature in the markets — because even if the Swiss government is keen, the Indian government does not seem to be keen to push the agenda,” says Jethmalani. Pakistan’s perennial structural weakness has been its abysmally low – and declining – tax collection. Even Pakistan’s most powerful government of recent times, that of Pervez Musharraf, left in its wake a tax-to-GDP ratio of less than 10 percent after over eight years in unbridled power. This is amongst the lowest tax collection ratios in the world. 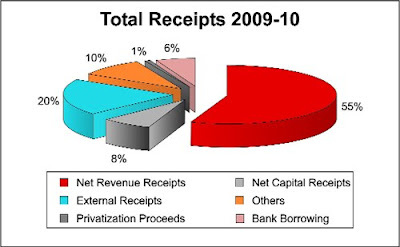 Leaving total collection aside, the composition of tax receipts in Pakistan depicts huge inequity. Direct tax collection constitutes less than 3.5 percent of GDP, with wide ranging exemptions to powerful segments of society coupled with governance issues at FBR. The bulk of the tax receipts are collected in the form of sales tax. Far from being progressive, the taxation regime is highly regressive, meaning that the poor and less affluent are taxed more heavily as a proportion of their income than the rich. The other weak (rather, missing) link in public finances is the lack of fiscal effort by the provinces. With some of the largest segments of economic activity such as agriculture, real estate, and services in the provincial domain with regards to taxation, it is baffling that provincial tax receipts total an abysmal 0.7 percent of GDP. At the heart of it, these issues are related to governance. This state of affairs is a manifestation of a broader challenge that Pakistan has grappled with virtually since independence – the shifting of the burden of responsibility by a small, self-serving and venal elite to the rest of the population. The flip side of not collecting taxes, and not being able to manage expenditures, is debt. This was never more evident than in early 2008 when a new government took office after elections. It inherited a tax-to-GDP ratio of less than 10 percent, a fiscal deficit of nearly 8 percent of GDP, and a current account deficit of over $14 billion (a record 8.5 percent of GDP). Despite receiving generous assistance from the international community year after year, as reflected in the country’s total external debt rising from $35 billion to $46 billion between 2005 and 2008 (over and above budgetary grants), the previous administration mind-bogglingly resorted to printing currency to the tune of over Rs 700 billion in two years. This factor was a major contributor to the spiral of inflation that was set in motion from 2007 onwards. The nexus between not collecting taxes and having to borrow cannot be over-emphasised. To place this in context, consider the following: if Pakistan’s tax to GDP ratio had been increased to a modest 13 percent in 2005 when the global as well as domestic economic conditions were most favourable, and kept stable since, Pakistan’s public debt would have been almost 15 percent of GDP lower (at around 44 percent of GDP, instead of close to 60 percent currently). Put differently, since 2005, the government has cumulatively borrowed over Rs 1,600 billion largely on account of not being able or willing to collect taxes. The net effect of this state of affairs was high inflation, pressure on FX reserves, a decline in the value of the rupee, and an erosion of market and investor confidence. This was a perfect recipe for tipping the country into a full-blown macroeconomic crisis, which came with full force in 2008. To stabilise the country’s fast depleting reserves, it is not surprising that the government had to resort to borrowing from the IMF in November 2008. Hence, the primary factors behind the increase in public debt over the past three years include recourse to the IMF, a large adjustment in the value of the rupee after several years of the currency being kept artificially stable, and a large decline in grants and other non-debt creating inflows such as FDI after 2007. ISLAMABAD: The Federal Board of Revenue (FBR) chairman Salman Siddique submitted in the Supreme Court on Thursday a list of 58 officials who held positions from January 01, 2007 to December24, 2010, when the national exchequer suffered a whooping loss of Rs37 billion because of pilferage of containers which entered the Pakistani territory under Afghan Transit Trade (ATT). The list submitted with the Registrar office through CBR’s counsel Raja Muhammad Irshad in compliance with the Supreme Court orders includes the names of former chairpersons of CBR/FBR, members of Customs, Customs Collectors Karachi Port and Port of Qasim, Collectors of Quetta and Peshawar, secretaries commerce and finance, Director General Customs Intelligence and Investigation and the relevant officers of NLC who held the charge during that period. The report contains the names of four former Major Generals of the National Logistics Cell (NLC) and three former chiefs of FBR. According to FBR counsel Raja Muhammad Irshad, the list contains the names of former Finance Secretary, former FBR chiefs Abdullah Yousuf, Ahmed Waqar, Sohail Ahmed and member Customs Muneer Qureshi. He said the names of six former secretaries, three former FBR chairman, three former heads of NLC and 44 officials of Customs are mentioned in the 58 members list. Federal Tax Ombudsman (FTO) Dr Shoaib Suddle has already submitted a comprehensive report over the matter in the Supreme Court testifying that a huge number of containers containing have been pilfered inside the country without crossing the border causing enormous loss to the national exchequer to the tune of Rs19-37 billion. He pointed out that the loss caused at the hands of Customs Department during the past almost four years is only a tip of the iceberg. The report said strict action is required against all the concerned officials of the Customs and other departments, who held charge during that period. The court thereupon directed the FBR chairman to furnish a list of these officials. The court has directed all these people to file their reply on the report of FTO through FBR by January 27. One analyst calls "black money" or illicit money India's curse. He's not off the mark - I have been hearing of and reading about this scourge ever since I was in junior school. Several decades later, the problem has only worsened. The government reckons there are no reliable estimates of "black money" inside and outside the country - a "study" by the main opposition BJP in 2009 put it at anything between $500bn to $1.4 trillion. A recent conservative estimate by the US-based group Global Financial Integrity Index pegs illicit capital flows between 1948, a year after Independence, and 2008, at $462bn - an amount that is twice India's external debt. India's underground economy today is estimated to account for half of the country's GDP. Strong words indeed. But they may not be enough to uncover India's biggest and longest-running scandal. This week, Finance Minister Pranab Mukherjee unveiled what critics said was a laundry list of tedious platitudes and obscure, non time-bound plans to check the "menace of black money". This includes joining a "global crusade" against it, creating appropriate legislation and institutions to deal with such funds and imparting skills to officers tasked with detecting such funds. In effect, what the government is saying is that after 63 years of independence, India has no institutions or trained people available to curb a brazen and thriving underground economy which rewards tax evaders, humiliates tax payers and widens inequity. There is enough evidence to show that there is little political or administrative will to curb "black money". India has double taxation treaties with 79 countries. But 74 of these treaties need to be tweaked significantly to include exchange of banking information between the countries. (Letters have been issued to 65 of these countries to initiate negotiation, says the minister.) India has apparently chosen 22 countries and tax havens for negotiating and signing exchanging tax information. Last year, a law to prevent money laundering was given more teeth - but laws are often flouted with impunity in the world's largest democracy. The government says it plans to hone direct tax laws further to begin taxing deposits in foreign banks and interests in foreign trusts. Independent economists believe that despite the government's recent noises, "black money" will continue to blight India and its economy. For one, it is a systemic problem. Those who don't pay taxes or stash away illicit money overseas comprise the political and professional creme de la creme - politicians, bureaucrats, businessmen, doctors, lawyers, chartered accountants, judges. That the government is not keen upon cracking down on illicit capital flows was evident, analysts say, when, in 2008, it refused to accept a compact disc from Germany containing names of account holders in a Liechtenstein bank. Last year, under opposition pressure, the government accepted the CD, but refused to disclose the 26 names of Indian account holders in it. Many believe that a year is enough for the account holders to move their money out of the bank. "Unless there is political will to dig out black money, nothing will happen," says Arun Kumar of Delhi's Jawaharlal Nehru University, who has investigated India's underground economy in detail. And the humiliation of the honest citizen will continue. This is the first time Assange has spoken about Indian accounts in these Swiss banks, and comes at a time when the national debate over Swiss Bank accounts has sharpened. Arnab Goswami: You have strong views on it. And I completely appreciate that you can't talk about it in detail. But let me ask you more generically, that is your heart, you would like to reveal the details...in your heart. I am not asking you when and under what circumstances, but having known about it, you would like to reveal details of how the system operates, wouldn't you? Julian Assange: Well, we have various types of information about different banking operations in the world. Over time, we have revealed those. In fact, most of the legal attacks on us have been from banks. Banks in Scotland...banks in Dubai...banks in Iceland. We all received legal attacks from these banks. And we will continue publishing data on these banks as soon as we are able to do so. Julian Assange: Yes there are Indian names in the data we have already published or going to publish. I can't remember specifically whether there are Indian names in the upcoming publication. But I have read Indian names. Similarly, in these private Swiss banking concerns, where you need at least a million dollars...which is a significant amount of money...Not an average Indian. Arnab Goswami: And it is difficult to identify those names. Anything else you can tell us? Julian Assange: I can't tell you anything more at this stage. As we go through the process of releasing data, as always we have to do extra research. And once we understand which media organizations are best placed to help us with that research, then we operate with them. But we are not at that stage yet that I know all the research that is going on. ISLAMABAD — Pakistan is defying mounting Western pressure to end a giant tax dodge with fewer and fewer people contributing to government coffers, spelling dire consequences for a sagging economy. Tax is taboo in Pakistan. Barely one percent of the population pays at all, as a corrupt bureaucracy safeguards entrenched interests and guards private wealth, but starves energy, health and education of desperately needed funds. Less than 10 percent of GDP comes from tax revenue -- one of the lowest global rates and worse than in much of Africa, say economists. Federal Board of Revenue (FBR) spokesman Asrar Rauf said 1.9 million people paid tax in 2010, less than the year before, despite 3.2 million being registered to pay -- itself a drop in the ocean of a population of 180 million. As a result, Pakistan's fiscal deficit widened from 5.3 percent to 6.3 percent of GDP in 2010, the Asian Development Bank said this month, knocking 2011 growth figures to 2.5 percent and predictions for 2012 to 3.2 percent. This month visiting British Prime Minister David Cameron pressed the point home, saying aid increases were a hard sell when: "Too many of your richest people are getting away without paying much tax at all and that's not fair". The IMF last May halted a $11.3 billion assistance package over a lack of progress on reforms, principally on tax. And despite a flurry of meetings, no new loan has been agreed in the run-up to the IMF and World Bank's Spring meetings. An IMF review mission is due to visit on May 8. "Consensus is building, we have almost reached agreement (on reform)," one government official told AFP, but gave no details. What would really work, say analysts, would be scrapping exemptions that serve entrenched interests, such as a 50 percent tax discount on sugar and a gate on taxing agricultural income that largely exempts wealthy feudal landowners. But stalemate and vested interests have made that impossible. "There's talk of early elections. One has a brittle coalition. A lot of the reform areas that need to be dealt with have very well entrenched and powerful lobbies that are making the case against it," said a finance ministry official. As it is, the tiny minority who contribute say they carry a disproportionate tax burden, for which they get nothing in return. Pakistan suffers from an awful energy crisis, yet government spending on electricity subsidies last year reached just under one percent of GDP, health spending 0.5 percent and education two percent, said the finance ministry. According to a 2009 study by the Pakistan Institute of Legislative Development and Transparency, the average member of parliament was worth $900,000 and the wealthiest $37 million. Those figures stand against estimates that a quarter of the population lives below the poverty line and that GDP per capita stands at $2,400. "No one trusts the government," says industrialist Mohammad Ishaq, former vice president of the chamber of commerce in the northwestern province of Khyber Pakhtunkhwa. "Without social welfare and with this corruption, nobody is ready to pay tax... in return one gets nothing -- no health, education, social security." Eunuchs have been appointed tax collectors in Karachi, the financial capital, on the understanding that a visit from the maligned transgender group would embarrass people into paying up. But former finance minister Salman Shah said tax evasion was inevitable because of corruption within the FBR, which employs 23,000 people nationwide. "There's a big mistrust of the tax authority itself. That's why a self-assessment scheme came in," said Shah. According to a position paper of the PBC on the macroeconomic stabilization, issued at the national dialogue of political parties on the national economic agenda, the reform of the tax system could be done by adopting the principle of taxation regardless of source of income. Several studies which have been carried out recently show that the government could generate an additional Rs300-400 billion in revenue within the present tax regime through better coverage and enforcement. The taxation measures should focus on documentation and broadening the tax base for direct taxes, PBC said. It stated that the presumptive basis of taxation should be replaced by net income tax earned basis. Wealth tax in the old form need not be introduced but a tax on assets created out of untaxed income be levied. Moreover, the reforms are needed to address over-invoicing, misdeclaration and Afghan Transit Trade leakage issues. The use of IT tools in customs could help in this regard. The gradual reduction in custom duties on smuggling prone items will discourage these malpractice. The provincial governments do have the necessary legislations in place to tax income on agriculture. The threshold levels, exemption limits should be reinforced, the collection machinery, compliance and enforcement measures strengthened. Urban immovable property tax in major cities can substantially augment the tax base of the local governments if a more realistic valuation is arrived at through periodic surveys and assessments. The expenditures can be reduced by restructuring of Public Sector Enterprises that will staunch operating losses; by Subsidy rationalization and targeting subsidies to the poor only through Benazir Income Support program (BISP); better implementation and avoidance of waste in development projects. If the above measures are implemented, and a policy that taxes incomes from all sources above threshold of Rs 300,000 is implemented it is expected that Tax -to- GDP ratio would reach 15 percent in five years time and sustained fiscal deficit would not exceed 4 percent of GDP, the PBC added. 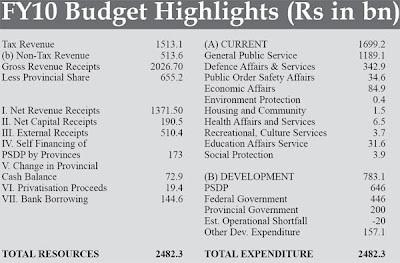 ..Finance Minister Abdul Hafeez Shaikh forecast a budget deficit of 4%, down from 6% in the current fiscal year, with economic growth rising to 4.2% versus 2.5%. In the most noteworthy new measure, Mr. Shaikh said the government was ending sales-tax exemptions on about 500 items, which will bring in fresh revenues of about 200 billion Pakistani rupees. But Mr. Sheikh at the same time reduced the general sales tax to 16% from 17% and failed to bring in bold new measures to increase the state's haul of income tax from the country's wealthiest citizens. "This is a business-as-usual budget. I was expecting it to be a reformist budget," said Ashfaque Khan, dean of the National University of Sciences and Technology Business School in Islamabad. U.S. Secretary of State Hillary Clinton, urged by the IMF, has publicly called on Pakistan in the past year to raise taxes on its richest citizens. The IMF itself has since last year withheld the disbursement of $3.5 billion in funding for Pakistan—the final tranche in a $11.3 billion loan package—due to failures to significantly raise taxes. The IMF has urged Pakistan to reform its sales tax to include services but this hasn't happened. The World Bank and the Asian Development Bank also have suspended budget-support funding which amounts to about $1 billion. Mr. Shaikh failed to announce announce any new measures to tax agricultural income, which remains exempt. The government says the issue falls under the purview of provincial governments. Many of Pakistan's richest people are feudal landlords who made their fortunes from agriculture. Mr. Shaikh, who was booed by the opposition, which at moments almost drowned out the delivery of his budget speech, said the government had identified 2.3 million wealthy citizens who currently pay no tax and whom it will pursue. He gave no further details. To fund its gaping budget deficit, the state has in the past year increasingly relied on borrowing from the central bank, essentially printing money and stoking inflation to 13%. Mr. Shaikh said the government had recently cut back on borrowing from the central bank and would aim to get inflation back to single digits. By borrowing so heavily from its own banking system, the government has choked off the supply of credit to private businesses. Foreign investors—already nervous because of the precarious security situation in Pakistan—have largely shunned the country. That has stunted economic growth, estimated at 2.5% for the year ending June 30, which is insufficient to create enough jobs for the two million new job seekers coming onto the market each year. The IMF says the country needs 8% annual economic growth to create enough work. India's economy, by comparison, in the year ended March 31 grew 8.5%. For now, Pakistan is unlikely to plunge back into a balance-of-payments crisis of the kind that forced it to call in the IMF in November 2008. That's because exports are doing well, fueled by high global agriculture prices for crops like cotton. The country is running a small current-account surplus, compared to its usual deficit. The currency, the Pakistani rupee, has been stable for the past few months and Pakistan's foreign-exchange reserves are about $14 billion, or enough to cover four months of imports. Still, oil-price rises this year is likely to increase Pakistan's import costs in the months ahead, which could send the current-account back into deficit. The poor state of government finances, if unchecked, could further undermine foreign confidence in months ahead, donors and analysts say. It’s early morning in Karachi, Pakistan’s biggest city, and Muhammad Nasir is outside his makeshift shelter of palm leaves, rags, and bamboo, washing up after breakfast. He uses water stolen from a nearby supply pipe that belongs to the local water utility. The 17-year-old bids farewell to his mother, an unlicensed midwife, and walks to his tire-repair shop, an open-air stand in a residential area with a table of tools and a wooden bench. He checks to make sure the electricity he’s drawing illegally from the overhead power line is on so he can run his tire pump. Then he sends 10-year-old Abid, one of his two employees, along with 12-year-old Irfan, to get tea from a nearby shop. Nasir’s business, his home, his power and water supply, and even the cup of tea Abid brings him don’t exist in Pakistan’s official figures. They’re part of another economy that doesn’t pay taxes or heed regulations. It probably employs more than three quarters of the nation’s 54 million workers and is worth as much as 50 percent of Pakistan’s 18 trillion rupee ($200 billion) official gross domestic product. And while the documented economy had its smallest expansion in a decade at 2.4 percent in the year ended June 2011, soaring demand for cars, cement for houses, and other goods shows the underground market is thriving. the nation’s purchasing power is more than estimated, says Nadeem Naqvi, managing director of the Karachi Stock Exchange. Rising crop prices have pumped an extra 1 trillion rupees into the rural economy in the past four years, most of it undocumented, Naqvi says. He estimates agriculture may account for as much as 35 percent of GDP, instead of the 21 percent reported. Evidence of consumer demand is everywhere as new shopping malls and restaurants in Karachi are filled to capacity. Car sales rose 14 percent in February from a year earlier, as more people could afford a Toyota Corolla or Suzuki Mehran (a small hatchback), according to the Pakistan Automotive Manufacturers Association. More than half a million motorbikes hit the road in the eight months ended February, a 5 percent increase, perhaps a sign that Nasir’s tire business has a bright future. .. The bottom line: If participants in Pakistan’s undocumented economy paid their taxes, the government would collect an extra 800 billion rupees. LAHORE: Chairman Federal Board of Revenue (FBR) Ali Arshad Hakeem on Saturday issued a warning to tax evaders and said the FBR had located over three million citizens who had enormous wealth but had not been paying their taxes, DawnNews reported. Speaking at a ceremony in Custom House, Lahore, Hakeem said out of a population of 180 million, only 800,000 people were paying their taxes. He said tax evaders were being given 75 days’ time to fulfill their responsibilities as citizens after which their names would be added to the exit control list (ECL) and their national identity cards would also be blocked. The FBR chief said Pakistan’s system of taxation was in dire need of reformation, adding that the country could not be run with the existing taxation system in place. Hakeem added that Pakistan had one of the lowest tax-to-GDP ratios in the world. He stressed that the country was in dire need of tax reforms and that the government should take immediate steps in this regard. The FBR chief’s remarks come in the wake of the introduction of a controversial tax amnesty bill in the National Assembly. The opposition says the bill is meant to provide opportunity to millions to whiten their black money whereas Finance Minister Dr Abdul Hafeez Sheikh has said that there were only 800,000 taxpayers in the country and the bill would bring a substantial number of people into the country’s tax net. Fiscal devolution involving the transfer of taxing and spending powers to sub-national levels of government is totally non-existent in Pakistan despite clear command contained in Article 140A of the Constitution of Islamic Republic of Pakistan. Pakistan is in dire need of fiscal devolution — presently major fiscal powers are concentrated in the hands of federal government. Even the Constitution denies the provinces right to levy sales tax on goods within their respective territories. The provinces have also shown apathy to devolve administrative and fiscal powers to local governments. Since all broad-based and buoyant sources of revenue are with the federal government, contribution of provinces in total tax revenues is only six per cent and in overall national revenue base (tax and non-tax revenue) just around eight per cent. This has made them totally dependent on the Centre for transfers from divisible pool. What makes the situation more disturbing is the fact that right of provinces to levy sales tax on services is encroached by the federal government through levy of presumptive taxes on services under the Income Tax Ordinance, 2001, sales tax on gas, electricity and telephone services and excise duty on a number of other services. Like other federations — notably India, USA, Canada — in Pakistan the provinces should have the exclusive right to levy indirect taxes on goods and services within their respective physical boundaries. Right to levy any tax on goods should be restored to the provinces as was the case at the time of independence. Despite levying of taxes by the federal government that should have been the provinces’ right, Centre has miserably failed to reduce the burgeoning fiscal deficit that is reaching a horrifying mark of Rs1.8 trillion this year. Had provinces been allowed to generate their own resources, the present chaotic situation could have been averted. The provincial parliaments in Pakistan should be pressurised by civil society to enact laws for establishment of local governments as ordained under Article 140A of the Constitution on the basis of social policy — they have so far just copied the previous outdated ones with patchwork here and there. The ruling classes do not want to empower people through self-governance. They want to enjoy total control over resources. The local governments will not be meaningful unless entitled, within national economic policy, to have adequate financial resources of their own, of which they may dispose freely within the framework of their powers and for public welfare. In a nutshell, for achieving the goal of fiscal devolution, local governments’ financial resources must be commensurate with the responsibilities provided for by the constitution and the law to ensure welfare of the people and ensure sustainable growth at grassroots level. Part of the financial resources of local authorities shall derive from local taxes and spent for providing universal entitlements and development. Pakistan must follow the model of welfare states where resources available to local governments are based on a sufficiently diversified and buoyant nature to enable them to keep pace with the real evolution of the cost of carrying out their tasks. Out of the 21 formations, only six were collecting taxes, which were more than the total administrative cost and salary of officials serving at these stations. All these stations are located in Lahore, Karachi and Islamabad. About 90% of the Rs64.3 billion was collected in these major cities since all major businesses have their head offices in one of these cities. The three LTUs situated in Karachi, Lahore and Islamabad pooled Rs57.6 billion or 90% of the total assessments. Faisalabad is the country’s third populous city and the textile hub. However, the station generated just Rs193.1 million in income tax through FBR’s efforts at a total cost of Rs527.6 million. RTO Multan pooled just Rs77.6 million because of taxmen’s efforts while its administrative cost was Rs523.5 million. The RTO Peshawar that deals most of the Khyber-Pakhtunkhwa (K-P) collected a meagre sum of Rs56.2 million at a cost of Rs561.4 million. The other station in K-P, RTO Abbottabad, collected Rs69.6 million through assessment but incurred Rs95.5 million. RTO Quetta collected Rs24.8 million at a cost of Rs86.2 million. RTO Gujranwala – largely capturing the industrial area – collected Rs30.8 million at a cost of Rs317.6 million. RTO Rawalpindi pooled just Rs46.4 million through FBR’s efforts at a cost of Rs417.2 million. RTO Sargodha collected Rs46 million at a cost of Rs187.8 million. RTO Sukkur collected Rs22.4 million at a cost of Rs223.8 million. RTO Sialkot – hub of surgical and supports manufacturing units – collected Rs25.5 million at a cost of Rs240.5 million. As an industrialist in Pakistan’s southern port city of Karachi recounts his woes, from frequent power cuts to a shortage of trained workers, his accountant barges in with a question. “Let me see how much we need to earn from the farm and get back to you,” the industrialist replies. The encounter provides a glimpse of one of Pakistan’s toughest economic challenges: reforming its chronically dysfunctional tax-collection system. Only about 0.5 per cent of Pakistan’s 200m people pay income tax, compared with 2-3 per cent in India and 20 per cent in China, according to the OECD. Compliance with income tax payments is so poor in parts of the country that the cost of running local tax offices exceeds the tax they collect. “Frankly, the government could end up saving money in some of our remote areas if the tax offices there were shut down today,” says one government official. The problem has not been solved by a plummeting poverty rate, which fell from 65 per cent in 1991 to 13 per cent in 2011 according to UN figures released last week. Huge numbers of affluent Pakistanis dodge their tax by colluding with corrupt tax officials to understate their incomes, exploiting loopholes, or both. In one of the most notorious ploys, people buy farmland — for which there is a tax amnesty — then overstate their agricultural income and understate earnings from other business interests. The country’s parliament, dominated by landowners, has blocked attempts by successive governments to remove this loophole. A December 2013 study by the Centre for Investigative Reporting in Pakistan reported that almost half of the country’s 1,070 lawmakers in provincial and national assemblies paid no tax the previous year. More than 10 per cent did not even possess tax numbers. The tax problem, analysts say, risks undermining Pakistan’s recent run of good economic news. Business confidence is on the rise, economic growth has been recovering, hitting 4.1 per cent last year, and official liquid foreign reserves have grown almost fourfold in the past year to $12.5bn. Last month the central bank cut its benchmark interest rate 1 percentage point to 7 per cent and consumer price inflation is about 2 per cent, having been stuck above 8 per cent only a year ago. But plunging oil import costs have played a large part in the upturn. The International Monetary Fund says decisive action on taxation is needed to back up this good fortune. Ishaq Dar, the finance minister preparing to present his annual budget on Friday, hails the government’s early success in broadening the tax base, boasting a rise of 200,000 taxpayers since mid-2013 to a total of about 900,000. Officials say people have been targeted for whom there was clear evidence of wealth, for example frequent foreign travel. Meanwhile, the country’s ruling elite show few signs of backing reform, according to western economists in Islamabad. “The political system is controlled by people who neither consider tax collection a big priority nor want to do anything beyond lip service,” says one. India is in the middle of an extraordinary economic experiment. On 8 November, Prime Minister Narendra Modi gave only four hours' notice that virtually all the cash in the world's seventh-largest economy would be effectively worthless. The Indian government likes to use the technical term "demonetisation" to describe the move, which makes it sound rather dull. It isn't. This is the economic equivalent of "shock and awe". Do not believe reports that this is primarily about bribery or terror financing, the real target is tax evasion and the policy is very daring indeed. You can see the effects outside every bank in the country. I am in Tamil Nadu in the south of India and here, as in every other state in the country, queues of people clutching wads of currency stretch halfway down the street. Mr Modi's "shock and awe" declaration meant that 1,000 and 500 rupee notes would no longer be valid. These may be the largest denomination Indian notes but they are not high value by international standards - 1,000 rupees is only £12. But together the two notes represent 86% of the currency in circulation. Think of that, at a stroke 86% of the cash in India now cannot be used. What is more, India is overwhelmingly a cash economy, with 90% of all transactions taking place that way. And that is the target of Mr Modi's dramatic move. Because so much business is done in cash, very few people pay tax on the money they earn. According to figures published by the government earlier this year, in 2013 only 1% of the population paid any income tax at all. As a result huge numbers of Indians have stashes of tax-free cash hidden away - known here as "black money". Even the very poorest Indians have some cash savings - maybe just a few thousand rupees stored away for a daughter's wedding, the kids' school fees or - heaven forbid - an illness in the family. But lots of Indians have much more than that. It is not unusual for half the value of a property transaction to be paid in cash, with buyers turning up with suitcases full of 1,000 rupee notes. The size of this shadow economy is reckoned to be as much as 20% of India's entire GDP. Mr Modi's demonetisation is designed to drive black money out of the shadows. At the moment you can exchange up to 4,000 (£48) of the old rupees every day in cash for new 500 (£6) and 2,000 (£24) rupee notes. There is no limit to the amount that can be deposited in bank accounts until the end of December, but the government has warned that the tax authorities will be investigating any deposits above 250,000 rupees (£2,962). Breach that limit and you will be asked to prove that you have paid tax. If you cannot, you will be charged the full amount owed, plus a fine of 200% of the tax owed. For many people that could amount to be pretty much the full value of their hidden cash. This is brave politics. Some of the hardest hit will be the small business people and traders who are Mr Modi's core constituency. They voted for him because they believed he was the best bet to grow the economy and improve their lot. They will not be happy if he destroys their savings. 1. Prize bonds are bearer's certificates....can be used to launder money on which taxes have not been paid. 2. Overseas remittances are considered legitimate tax-free income. 4. Anyone with foreign passport or residency permits like iqama can falsely claim to be non-resident (Law says they must spend over 180 days abroad) whose income in exempt from taxes. Pakistan will use its national identity database to build profiles of potential taxpayers in a renewed bid to broaden its tax base, Prime Minister Shahid Khaqan Abbasi said. The plan aims to increase the number of taxpayers in a country where less than one percent of its 210 million people pays taxes. It seeks to plug leakages, encourage correct property valuation, lower individual tax rates and offer an amnesty program, Abbasi said in an interview in his home in Islamabad. Lenders including the International Monetary Fund have repeatedly shown concern over Pakistan’s tax-to-GDP ratio of about 12 percent, which is among the lowest globally. In the past, attempts to force people to pay taxes have been met with resistance and strikes by businesses, while various amnesty plans announced -- including one eight months ago -- failed to boost revenues. Now Abbasi wants officials to build taxpayer profiles through the National Database & Registration Authority. With elections scheduled for July 15, the South Asian nation has been weathering political instability and economic stress for the past year. The nation’s current account deficit widened about 60 percent to $7.4 billion in the six months to December and foreign exchange reserves are deteriorating, prompting the finance ministry to raise $2.5 billion from global bonds and sukuk in November. A month later, the government allowed the devaluation of the rupee. The last tax amnesty plan resulted in just 0.3 percent of 3 million traders registering with the tax authority before it was withdrawn in April. This time, the program will encourage Pakistanis to account for their wealth with a fee of 3 percent, down from 10 percent previously, Abbasi said. In another step, the government will streamline property valuation to discourage investment in the sector to evade paying taxes. Abbasi, who became the premier in August after the country’s Supreme Court dismissed his predecessor Nawaz Sharif after a probe into his family finances, will have about five months to implement his initiatives before he hands over power to a caretaker prime minister in June.